With a Progressive web app, you can tap into a wider audience on any device. Progressive web apps showcase your portfolio, online store, services and much more. Since progressive web apps are receptive and compatible across any screen size, your business or organisation can reach out to an audience that is always on the move and who mostly browse the internet using a mobile device. Businesses can benefit from an online and offline feature that results in better engagement across users. A common challenge with native mobile apps is the need to download and install them on multiple devices and you eventually run out of storage or users just don’t bother. A study suggests 25% of app users have to delete an app to release storage space on their mobile device for any reason and yours could get deleted. Progressive apps work just like regular apps except that you access them through your web browser on your preferred device and they can be saved to the home screen and look very app like. It can be really painful to be notified of an update to the latest version of your mobile applications. Progressive web apps have taken care of this and since they work like websites, they are automatically updated, which is a big plus. One of the biggest aspects of progressive web apps and can function even with low-quality internet connection. 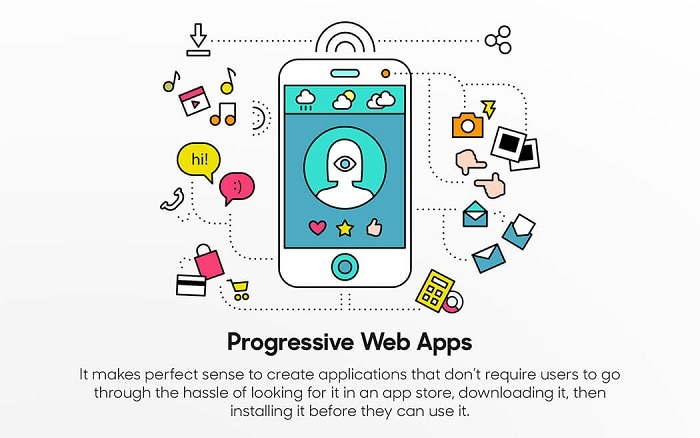 The important reason to choose progressive web apps, compared to using native apps is users have to download native apps from the store and are required to accept app permissions before using them. With progressive apps, users only need to find your website and get launched into the business PWA without having to download anything. This also means a user has an absolute native app like experience and it imitates any action you would find on a native app. Progressive web apps vary from online ordering to information management. Web users also have the flexibility to save the progressive web apps shortcut to their home screen that enables access at any time. More websites are programmed to shift to HTTPS websites since they offer a guarantee to keep your information secure. Web app developers also make use of Fetch APIs and Cache to load progressive web apps faster, speeding up the time to load content. Our PWA’s at TheAppOffice.com by default use SSL and that makes them great for being better indexed by Google and compliant to many security standards.